"I wish we could live together forever, but that's impossible." Some great directors are chameleons, constantly reinventing themselves from film to film as they try out new themes, new genres, new styles. Others, no less skillful, find their niche early on in their careers and stay with it, giving a consistency to their body of work. Yasujiro Ozu, one of the world's great film directors, falls firmly in the latter camp, with a series of intimate family dramas exhibiting an idiosyncratic and fascinating style that's completely at odds with typical Hollywood fare. The story of Early Summer is centered around the Mamiya ie (extended family), including Grandpa (Ichiro Sugai) and Grandma (Chieko Higashiyama), their daughter Noriko (Setsuko Hara), their married son Koichi (Chishu Ryu), his wife Fumiko (Kuniko Miyake) and his two young sons. Noriko has reached the age of 28, "time to get married" in the words of Grandpa. Much of the plot centers around the family's attempt to fix up Noriko with a well-to-do acquaintance of her boss, but Noriko thinks otherwise, and prefers an old friend, widowed and with a child, much to the family's chagrin. As is typical in many of Ozu's films, Noriko's eventual happiness leads to unhappiness for the rest of the family, and the result is bittersweet and emotionally affecting. Although Ozu is often said to embody traditional, even conservative Japanese social values, this isn't true, strictly speaking. The spread of Western values to Japan, begun in the 1930s, was brought to an abrupt halt with the coming of World War II, and even in the 1950s notions of an unyielding patriarch, the importance of the extended family, and the propriety of arranged marriages were widely observed. In showing us a family that comes to accept a marriage based on love (of a sort), to a man with children, Ozu is in fact being quite progressive for his time. But it's not because of Ozu's plots, his modern views, or his ability to engender emotion that he's most popular with critics and film buffs. The primary interest with Ozu's films is in his style, his consistent breaking of the "rules" of what's right and wrong when making a movie. These rules, codified in the silent area, are no more or less arbitrary than any other set of governing principles, but they've held sway over most narrative films from nearly every country and every decade, and we've learned to regard movies that obey these rules as natural and realistic. One of the most important of these rules is that the camera can never cross an imaginary line that separates itself from what's being filmed. It can move closer or farther from the line, and change angle, but the camera can never be placed on the other side of the line. It's almost as if the camera can be in any theater seat while a play is being performed, but can't suddenly shift onto the stage and film the performers from the other side—this was thought to be too jarring and confusing for the viewer. But Ozu ignores the rule, and uses all of the space around his characters, sometimes even shifting camera angle by 45 degrees from shot to shot until the camera's made a complete circle. And for conversations, he'll often place the camera between two people and point it directly at each character as they speak, so they're gazing directly (or almost directly) at the camera—another big no-no in classical style. And Ozu breaks the rules in other ways. He uses a low camera height, placing it much closer to the floor than most directors. (It's often called low camera "angle," but this is a misnomer, since the camera's still pointed horizontally.) He'll often emphasize props in the frame, but it's not because they're important to the narrative. Sometimes sequences are separated by shots of spaces or buildings that we don't recognize, and can't be assimilated into the rest of the film. A film following the classical rules puts the space created by camera positioning at the service of the narrative, but Ozu's idiosyncratic style creates a space that's more independent and less subordinate to causality. Ozu's style is sometimes seen as a reflection of traditional Japanese aesthetic values, and he's often called "the most Japanese of Japanese directors," but this description is incorrect. When Western critics, accustomed to sword fighting epics and period pieces such as Ugetsu and Rashomon, first saw his films, they mistakenly assumed that his consistent rule-breaking was unconscious, and typical of Japanese family dramas of the time. It was only later, with the availability of similarly-themed films by Gosho and Naruse, that it was recognized that Ozu was in fact a maverick, obeying his own instincts and artistic impulses, and deliberately straying from both Western film norms and his peers in Japan. Early Summer is not as effective as Tokyo Story, but it's quite good. Ozu's films are under-represented on DVD, and it's thanks to Criterion that we have a third example of this fascinating filmmaker's work. Image Transfer Review: For the most part, the image is good, with reasonable black levels, good contrast and quite a bit of detail. Some scenes are soft, and not even digital restoration could clean up all of the problems in the source print, including flickering, light vertical lines and some speckling. Not to make the transfer sound any worse than it is�it's perfectly acceptable for a film of this vintage, and the only real annoyances are occasional gate float and frame jumps immediately after cuts. Audio Transfer Review: The mono sound isn't very good, with a limited dynamic range and some harshness. It's been digitally restored, but the hiss that's present whenever a character speaks apparently couldn't be fixed. You'll probably want to keep the volume fairly low. Extras Review: Filmed on video at Jochi Temple in Kita Kamakura, the 47m:40s Ozu's Films from Behind the Scenes was produced by the Shochiku studio for the centenary of Ozu's birth. This extended chat between Ozu's sound and editing assistant Kojiro Suematsu, his assistant cameraman Takashi Kawamata, and Shizuo Yamanouchi, who produced six of Ozu's films, is a relaxed but informative collection of anecdotes and reminiscences about Ozu's career and films. Many of the comments are given over to Ozu's working methods, from the scriptwriting process to his perfectionist selection of outdoor locations and set props. Ozu's reluctance to switch to color and his dislike of Cinemascope are discussed at some length, and there are a few interesting personal details, such as his kindness to his crew members and his legendary sake-drinking prowess. The conversation drags a bit in places, but Yamanouchi usually keeps things moving at a good pace. At times, Japanese subtitles stream across the bottom of the screen, clarifying technical terms (from what I could gather, as they're not translated). Ozu scholar Donald Ritchie provides the continuous commentary track, and as usual with him, it's well-informed and interesting. He thankfully spends a minimum of time describing what's happening on the screen, preferring to analyze the characters, their relationships, and their functions in the narrative. He places Early Summer in the context of postwar Japan and discusses how societal norms of the era are both reflected and contrasted within the film, explains the differences between Japanese and Western interpretations of realism, and analyzes the structure of a typical Ozu sequence and the film as a whole. It's a great commentary, useful for understanding both Early Summer and Ozu's oeuvre. The trailer is soft, with low contrast, a few speckles, and occasional jumps. The sound is muffled and hissy. Film professor David Bordwell and filmmaker Jim Jarmusch each contribute two pages of notes in the printed insert. Bordwell analyses the film as an ensemble drama, and notes its architectural construction and blend of tones, while Jarmusch talks about his pilgrimage to Japan and how Ozu inspired him. 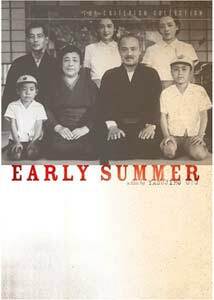 Criterion has released a third work by Yasujiro Ozu, and Early Summer is a treat that will intrigue fans of the director, and anyone interested in a unique style that doesn't kowtow to the Hollywood norms. The extras, while not as extensive as those included with Tokyo Story, are interesting and informative. Kudos to Criterion for another great release.